Last week I went from my home in the San Francisco Bay Area to Ashland, Oregon and back in my Tesla with software version 6.2.4.153. I do this trip twice a year as I really enjoy the plays at the Oregon Shakespeare Festival — where 2/3 are not Shakespeare plays — along with the wonderful food and ambiance in the town itself. On the way up, I drove a circuitous route through the Petaluma supercharger and experimented with the new trip planning feature, and on the way back I explicitly tested the feature. The trip planner technically is still in Beta and was added to help us plan our trips and reduce range anxiety. Unfortunately, the software still has quite a few problems that inadvertently caused me some minor range anxiety. Tesla divides the software into three different features: trip planner, range assurance, and navigation. The trip planner helps you determine how much time to charge at each supercharger. The range assurance software lets you know that you potentially may be running out of energy while driving. The navigation software has been part of the software since the Model S began shipping. To the end user, all three of these pieces of software have high degrees of interaction. This review of the trip planner software inevitably discusses all the software in totality. On the way to Oregon, I stopped in at the newer Petaluma supercharger and decided to drive up through Calistoga and avoid some of the very boring Interstate 5 (I-5) driving. Prior to the trip, I planned the journey in some detail using evtripplanner.com. The total miles between the Petaluma supercharger and the Corning supercharger on I-5 is 165 miles, which should use up 52.6kWh on my 85 with 21” wheels in typical nice California weather. In Petaluma when I selected the Corning supercharger, the navigation system really wanted me to go to the Vacaville supercharger first. I could not overwrite the path as the software does not allow any waypoints on your drive. Waypoints are intermediate points that you can select to choose between alternative routes. 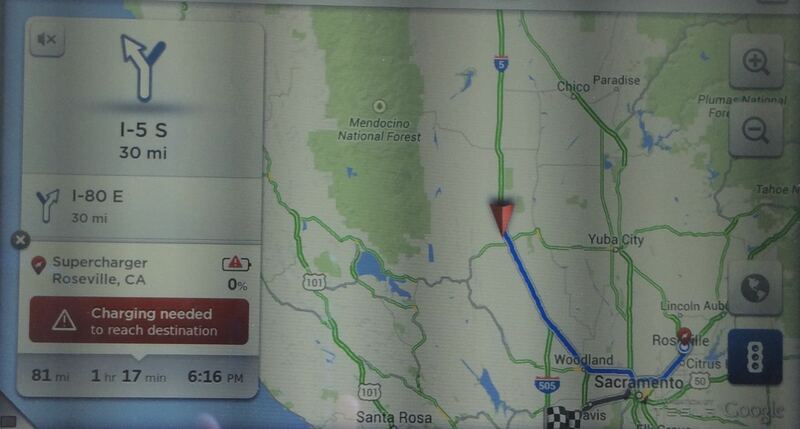 The Tesla navigation system has a very strong preference for freeways. By the time I got to Calistoga, the software finally gave up and routed me directly to the Corning supercharger showing I would have a 28% battery upon arrival. Software Weakness #1 – Navigation System really needs waypoints to allow the user to select alternative routes. I went for a very nice hike in Robert Lewis Stevenson State Park which is at the summit of a small mountain range. When I got back, the software was completely confused and reported that it would only have 5% of battery when I got to Corning and that I needed to drive slowly. Since I was paying close attention to this new software and have driven cross country in the Tesla, I was not alarmed and realized my problem was likely that the car could not connect to the internet. After driving downhill about 10 miles, the 3G connection finally kicked in and the number shot back up to about 28% battery remaining. Software Weakness #2 – The trip planner needs to store more information so that in period without internet access, the software does not report incorrect data. The next day I headed towards Ashland after charging that morning at the Mt. Shasta supercharger. I was only going to drive to Ashland and stay there and return to the same supercharger. Because I have done this route a few times in the Tesla, I did not pre-plan my trip to and from the Shasta supercharger beforehand. I charged the car at Mt. Shasta to what I suspected was “full enough” and not a range charge; I unfortunately did not note the exact amount of charge. The driving distance between Mt. Shasta and Ashland is only 75 miles and there are a few slower chargers in town. But I would have dearly loved to have a round trip feature on the trip planner, so I would have known how much I needed to charge in Mt. Shasta. The elevation change is 1,653 feet so using the number of miles is not sufficient to estimate charging needs. I did not remember how much I had charged on previous trips. Software Weakness #3 – The Trip Planner needs a roundtrip feature. Ashland has a few chargers in town, so I decided to stop and try to top off the Tesla at one of them. Even if the Tesla software is far from perfect, I do not particularly enjoy dealing with external charging stations. The stations in Ashland are no exception. I have charged there once before. But Ashland is very strict with their parking rules; I have gotten a ticket in the past for staying about 15 minutes past my four hour allowed time in the same parking lot. I was a little nervous with the ubiquitous signs stating “Head In Parking Only” when the cord would not reach while parking head in. The second problem was that I simply could not read the cracked and dirty screen in the direct sunlight. The third problem was that when I pulled out my Blink charging card, I got the error “Access Denied”. I incorrectly figured I had enough juice and gave up. The hotel I like to stay in Ashland has a terrible entrance to their parking lot. Under the small outbuilding is a eight car parking garage with a short but steep entrance. 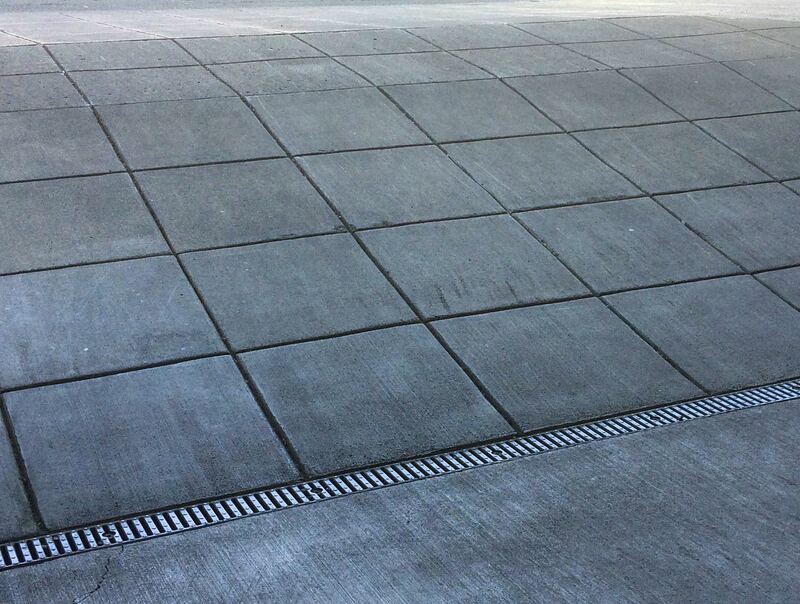 On the pavement are scratch marks from the many cars that scrape the pavement. I have earlier raised the car in this exact same location, but I figured the car would automatically raise itself. Unfortunately, the Tesla seemed to have a bad memory and I scraped the car a tiny bit. I manually raised the suspension, and the screen said “Auto-raising location” after the fact. As a test, I drove away, lowered the suspension, and re-entered the parking lot but the car did not want to raise itself automatically. Software Weakness #4 – The auto-raising location detection or activation does not seem to always take affect where needed. The morning when I was leaving Ashland, I selected the Mt. 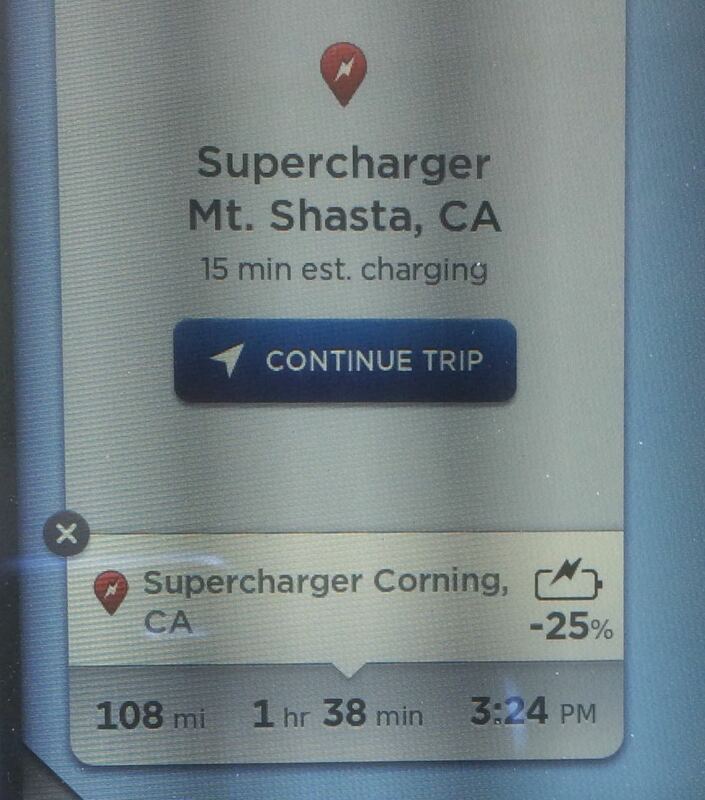 Shasta supercharger on the map, I realized I did not have enough energy to get to Mt. Shasta and the car wanted to go to the next supercharger to the North. I decided to top off at the Blink charger. 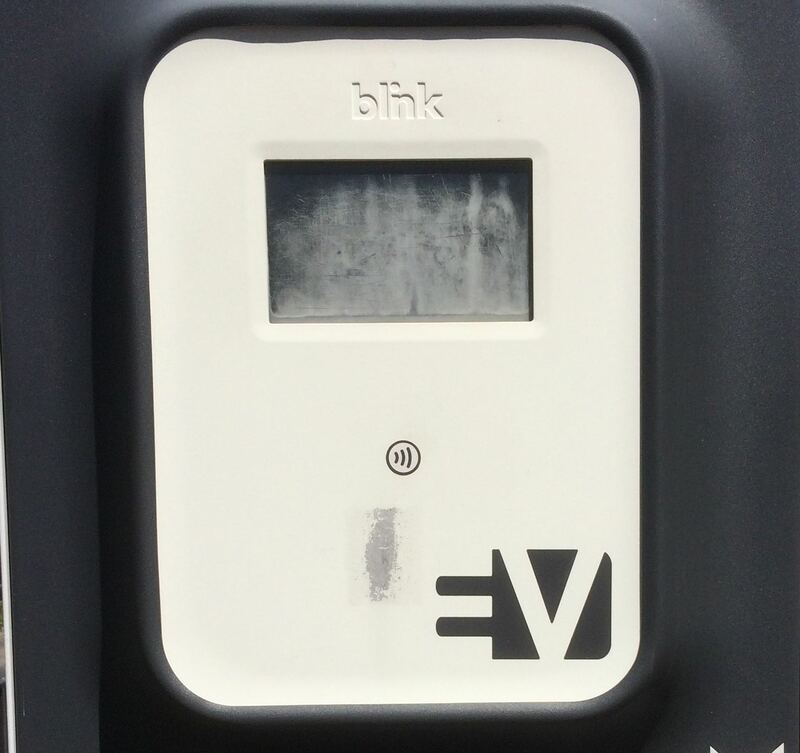 I backed in and called Blink, who said that particular card was not activated. I must have used the iphone app the other time I used their system. The nice feature about superchargers is that they are significantly less complicated. There are several charging networks with various maps, cards, smartphone apps, cable lengths, charging rates and connector types. With infrequent use of general charging, these relatively easy differences can feel complicated. The superchargers are always free and always have the same cable. After an unexpected lovely morning charging in Ashland enjoying a late breakfast, I decided to embark on the real test of the Tesla trip planner. I was going to drive straight home and follow the instructions given by the Trip Planner. I was not going to take any significant detours other than a quick stop or two right off the freeway where needed. I decided to do a formal “test” of this new feature. I was going to visit as many superchargers as needed and charge the exact amount of time listed. 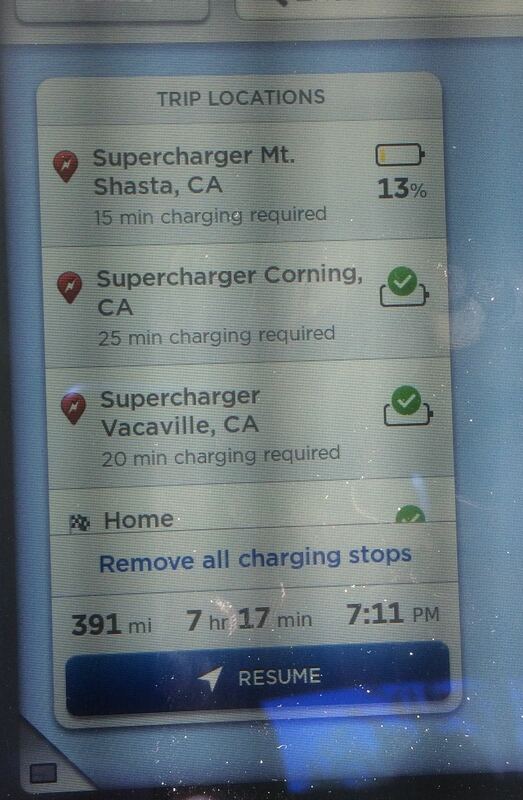 For this journey, the total amount of supercharging would be exactly an hour at three different superchargers: Mt. Shasta (15 minutes), Corning (25 minutes) and Vacaville (20 minutes). While driving I watched to see if the numbers changed. I kept close to the speed limit perhaps exceeding it by up to 5mph. The test occurred on a Sunday afternoon where I-5 is actually reasonably busy and has a comfortable 70mph speed limit for most of the journey. For late April the weather was a bit warm in the high 80s but not exceptionally hot for the central valley of California. When I arrived at the Mt. Shasta supercharger I was the only Tesla there. The software does a nice job reporting progress while charging. It lists how many more minutes you need to charge and also the amount of energy you will have left at the next charging station. The estimates also include a negative charge, which is a nice feature to monitor while waiting. I quickly filled up as needed in the 15 minutes of time listed. I was comfortable with how many miles I had in the battery. When I am at home, I like to see the amount of energy in the battery listed as a percentage, but when traveling I like to see the distance in rated miles (not ideal), so I can quickly compare it to the amount I would need to travel. After the 15 minutes were up, the car let me know it was ready to go both on the car’s screen and the Tesla Iphone app. On the way to Corning, I noticed that the software seems to think in 5 minute intervals. From time to time it seemed to estimate that it might take 20 minutes to charge at one of the superchargers, than it changed its mind to 25 minutes. I’m not sure why Tesla decided to not make the number of minutes more granular as they are still estimates. At Corning there was another Tesla there, but I pulled into a charger that was not paired with theirs. I went for a stroll, but I was not hungry enough to grab a bite to eat and was going to find something in Vacaville. My charge took the 25 minutes as required, and the car told me “You have enough energy to continue on your trip”. I recorded on the Tesla app a charge of 140 miles. Google maps indicates the driving distance is 113 miles. EV trip planner also says there is a drop of 174 feet. Although the buffer was not large, I was comfortable enough driving on. A little after 5pm, the hunger pangs hit in and I decided to find some vegetarian fast food. Just off the exit in Willows, CA is a Burger King, which sells a vegetarian burger. After picking one up, the range assurance software became very unhappy. I had not even added a mile to my trip, but it wanted me to go back to Corning. I refused and checked my battery level and was comfortable I could get to Vacaville. I continued on driving just under the speed limit at 68 or 69 mph and kept my kwH / mile at a reasonable level. I was comfortable with the amount of energy in my battery. I turned off the navigation as it continued to want me to make a U-turn. I briefly became a bit anxious; I was finding the navigation system was giving me more range anxiety than I have had in the past; I did not actually have “range anxiety” but I was slightly disappointed that I unexpectedly need to pay more attention to my energy usage than expected. In my 40,000 miles of driving the Tesla I have never experienced any true range anxiety. I have experienced a few periods of time where I needed to drive conservatively. These few cases were planned in that I knew I was pushing the limits of charge in my battery before I began driving. I turned the software on again a few times to see what it decided to do. Somewhere in the middle of the two supercharging stations, it told me to go find another place to charge! For entertainment purposes, I hit the show chargers option. It wanted me to drive over the mountains and go to some wineries on the way to Calistoga. I was definitely not going to do that option, and turned off navigation and continued my conservative driving with the cruise control on. When I asked the Tesla where to go at one point it wanted me to drive to the Roseville supercharger first and arrive there with zero charge! The distance between the Corning supercharger and the Vacaville supercharger is 113 miles, whereas the distance between the Corning supercharger and the Roseville supercharger is 128 miles. Software Weakness #5 – The software needs to remember in the cache that it had earlier told me I had enough energy to get to the next supercharger. I was driving within the speed limits. Just because I used up perhaps a wee bit more energy and would arrive with 20 miles left instead of 25, the software should not get completely confused. Ironically just across the street from the Burger King is a Motel 6 with a Sun Country charger. Also fifteen miles before Vacaville is a public charger in Winters, CA. These two options along with a few other choices along I-5 and in Woodland would have been much better choices in a real charging emergency. Charging stations are not ubiquitous along I-5 but do exist. Software Weakness #6 – When suggesting emergency charging, the software should list all charging stations. Currently it appears to list only Tesla HPWC and superchargers but not the more ubiquitous chargers by other companies. Even better yet, it should tell you to significantly slow down. I could have easily driven 60mph. As I was approaching Vacaville, I began to speed up a bit. The software finally settled down and routed me to Vacaville with some remaining charge. The Vacaville supercharger was quite busy. I pulled into a non-paired stall with 17 miles left. Another person arrived just before me but selected a paired stall. I have noticed that many Tesla owners simply drive up to any supercharger stall without even checking the stall designation. Perhaps they are uninformed that their charge can be greatly reduced if they pick a paired stall with another recent arrival. Backing up is a bit tricky in some of the stalls in Vacaville. There room in front of the middle stalls is hampered by perpendicular parking in front. By the time I backed in, the out of state drivers had already walked away from their charging stall. Software Weakness #7 – The warning indicator “You have enough energy to continue on this trip” is not carefully programmed. The software told me I had enough energy to continue on the trip with a very small margin below 25 miles. I am guessing that the timer stuck to the initial 20 minutes instead of charging time instead of accurately measuring the charge level upon completion. Instead of continuing, I saw another car had left and backed into and charged some more. The charge rate was painfully slow as I was in a paired stall with I suspect someone pulling a lot of energy. I probably left about 10 minutes later knowing I had to drive conservatively to make it home. The Bay Area has a lot of gentle hills and I would need to use a little more energy for the last leg of my trip. About 30 miles away from home, I got the Tire Pressure Warning (TPWS) light come on. I have not received this warning in over a year. In the past I got a lot of false warnings and some very genuine warnings before a potential blow out. I pulled over and looked at the tires and they did not look visibly low. When I got back in the car the warning went away, only to reappear and disappear again 15 miles later after looking at the tires again. The next day I took the car to my local garage and one tire was lower by about 10 psi and had a nail in it. The TPWS worked well and saved my tire. I’m not sure why the behavior flickered on and off. The perpendicular angle of the nail resulted in a slow leak and the tire is now repaired. Tesla is headed in the right direction by helping drivers plan their energy usage. They correctly labeled this software as a Beta version. Most of the problems I found were more software weaknesses / enhancements than explicit bugs. Unfortunately in the current condition the software will do little to reduce range anxiety and in some cases may significantly increase range anxiety. In the current software, Tesla is trying to appease two opposing needs at the same time: range anxiety and optimal charging time. Unfortunately, these two needs are actually inversely correlated. If I want to have no range anxiety, I would fill up the battery as much as possible before continuing or at least add more of a cushion, but that would take up more time at the superchargers. If I want to optimize my charging time, I need to watch the driving speed and monitor the energy usage. If I always keep the battery as low as possible, I could easily have some range anxiety or a trip where I need to monitor energy usage. Software Weakness #8 – The software should have an option for selecting between truly optimal supercharging times or range anxiety cushions. Clearly the software is aiming that you arrive at the next supercharger with 25 miles left. I find this a reasonable cushion for point to point conservative driving. Perhaps the software should have an option: range or time. The time would be in the current configuration. I doubt anyone would want to plan with less than a 25 mile buffer. The range option would perhaps increase this buffer by 25 miles to 50 miles. The current software is useful for existing Model S owners, but in its current state it will not address the concerns of the non-tech savvy person who may have range anxiety. I have forwarded this review to Tesla management, and I am confident that the software will improve over time. The amount of time to charge at each supercharger is relatively aggressive leaving you only 25 miles extra driving distance at the speed limit. You may get some scary warnings if you veer off the software’s designated path. The Tesla software does not include any non-Tesla chargers – either commercial stations or free if you are close to running out of juice. Please consult other websites or smartphone apps if you are running out of energy. The software may notify that your battery is full enough to leave the supercharger but may actually need more time. Double check the charge before unplugging. The software may give you false warnings when out of cell signal range. This entry was posted in Active Air Suspension, battery, cell coverage, charging, Charging Stations, clearance, complaint, Destination Charging, Efficiency, Iphone, Maps, Model S, Navigation, Review, Software, Superchargers. Bookmark the permalink. Edit: ” does seem to always” → “does not seem to always”. Ah yes, totally turns around the meaning of the software problem! Post edited. If you lower to quick after leaving the place where you lowered you car, it will actually delete the location. Probably this was why it didn’t auto-raise the car when returning to the parking lot. Great post, thanks! I feel they should build in a larger buffer than 25 miles; unpredictable things can affect how much “25 miles” really is. I wonder if they take the recent driving (past 15/30 miles) into account…perhaps they should (I know, that can be misleading, too!). Great data. I hope you passed it along to the company. Yes I sent Tesla the report before I posted it here. I wonder if it was acting strange about Vacaville due to the heavy load on that SC. They may be trying to route people away from SCs that are full, as having to wait 20 minutes for a SC could be a lot more misery-inducing than driving an extra 15 minutes to one that has open spaces. I don’t think so as I was on the way home, not to a supercharger. In fact that same case just happened to me today between Richfield and Nephi Utah with no one at either station. Can you please elaborate on the parallel charing thingy? Do you mean the dual chargers? I don’t have dual chargers and they only work when charging at AC outlets not superchargers. September 29, 2015: We took a long trip over the last two weeks and the NAV system appears to be no better! Nav told us to go back to the previous station several times. The first time we actually took the exit before we realized it was bogus. Aagh! We have version 6.2(2.5.36) but the same software problems are still there 5 months later. I think Nav creates range anxiety! If I had read this account before the trip I would not have been so surprised by the shortcomings of the Nav system. Our problems were in Montana, Wyoming and South Dakota. We did not notice if the problems correlated with 3G dropouts. I also have yet to see an improvement with this software. Hopefully soon.